The Katharine McPhee and Jack McBrayer-starring music will undoubtedly leave audiences at the Adelphi Theatre in London with a slice of “Sweet and Fulfilling Jammy Musical Pie”. The latest Broadway export landing in London’s West End is the Sara Bareilles-penned Waitress – a new music about a waitress (obviously) and expert pie-maker who dreams her way out of her small town and rocky marriage… whilst plenty of new challenges and potential love interests block her path. 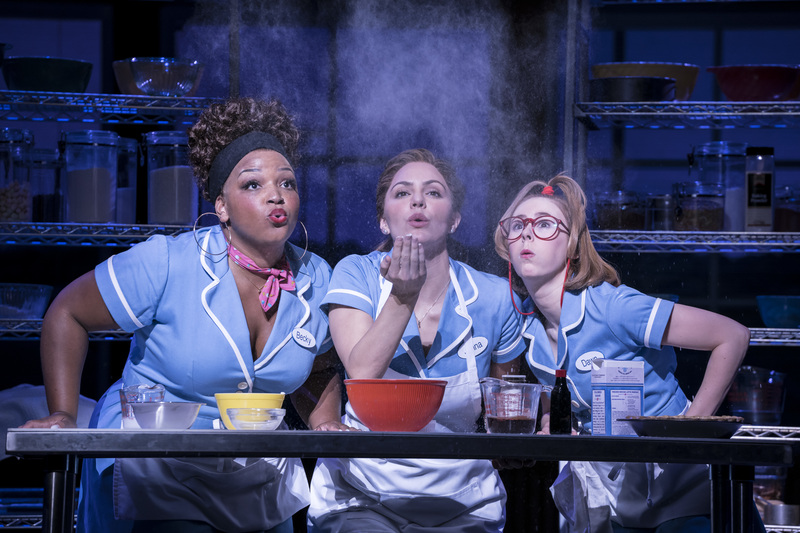 The musical is a fresh change to the West End – where so many other musicals follow the same topes and trends, Waitress doesn’t. In fact, it’s one of the only musicals in recent memory where the ending wasn’t entirely predictable by the interval! Featuring an excellent cast – including American Idol runner-up Katharine McPhee who’s vocals are a stand-out feature of the production and comedic actor Jack McBrayer (best known from TV series “30 Rock”) – Waitress does not struggle to transport audiences to Jenna (McPhee)’s small town bakery… every second of the musical is as entertaining and believable as the last. Supporting cast members Marisha Wallace and Laura Baldwin, playing Jenn’s co-workers and confidants Becky and Dawn, respectively, are also stand-outs. Marisha’s vocals are out of this world and Laura’s acting provides the much-needed comedic break at times. The music also doesn’t let down; 7-time Grammy nominee Sara Bareiles’ music and lyrics keep the storyline moving. Musically, the highlight of the show comes in the second act with “She Used To Be Mine” – an intimate and heart-breaking performance. Other than that, the only other memorable piece of music is opener “Opening Up”. Whilst there are incredible smelling pies (we don’t know if it’s just our brain playing tricks on us but we really could smell some of the pies being “baked” on stage! ), a surprising storyline and impressive vocals, Waitress does face pitfalls. The complex storyline is slightly difficult to follow at first and the lack of memorable songs doesn’t provide the “humming along” value as you leave the theatre. However, the ending did nearly have us in tears (of happiness! )… so we weren’t quite in the mood for singing anyway! If Waitress is a sign of things to come in the West End, then the long-standing musicals should be worried. It’s modern, it’s funny and it’s meaningful – and isn’t that all we want from entertainment nowadays?! Audiences are undoubtedly going to be leaving the theatre with a slice of “Sweet and Fulfilling Jammy Musical Pie”. After 11 years, audience favourite Wicked still holds onto it's title as one of the most relevant shows in the West End.